Growing up in the 50s and 60s, we were lucky enough to enjoy all the wonderful little magazines available on the newsstands during those decades. They were called digest and they covered every genre imaginable. We fondly remember having subscriptions to both The Worlds of If and Analog; two of our favorite sci-fi monthlies. Every now and then we’d pick up a mystery digest like Alfred Hitchcok and Ellery Queen as well. It seemed whenever any particular mystery series made it big in the paperback field, invariably there would be a digest monthly. I can still recall picking up copies of The 87th Precinct Mystery Magazine and Shell Scott Mystery Magazine. Both were short-lived, but not so the popular Mike Shayne Mystery Magazine that, as best I can remember, was around for a long time. Today the digests are all but gone save for a handful. Which is why we were delighted to see the arrival of a brand new title that is actually devoted to those great little monthlies; The Digest Enthusiast. 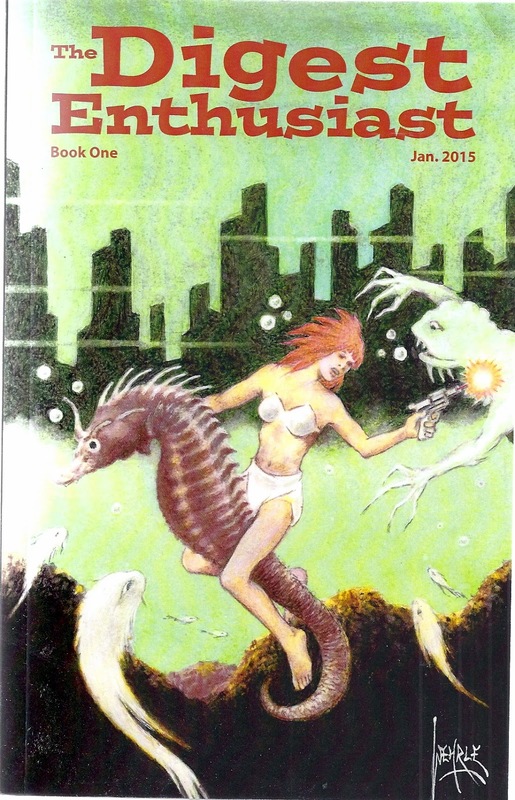 Issue number one is an eclectic treasure of both factual article on specific digest titles of old, a review of another little series, The Paperback Parade, and three really excellent short stories done in various lengths by writers Joe Wehrle Jr, Lesann Berry and Richard Krauss. We hope this inclusion of short fiction will be permanent feature and offer new pulp writers another market for their tales. Among some of the digest title histories examined here are Coronet, Galaxy Science Fiction and Photo-rama to name a few. We have to confess, our favorite article was the interview with Canadian fan/writer Matthew Turcotte in regards to his collection of Archie Digests which he claims is well over thousand issues strong. Just amazing. The Digest Enthusiast is extremely well produced, with clean layouts and clear, expertly printed articles about a lost American publishing format. We recommend it highly to all our pulp readers. Every now and then the universe offers up such an unexpected surprise, we are left with such a euphoric rush as to describe the feelings as miraculous. That was our experience just a few short weeks ago when the mail delivered this lost Mike Hammer thriller into our hands. 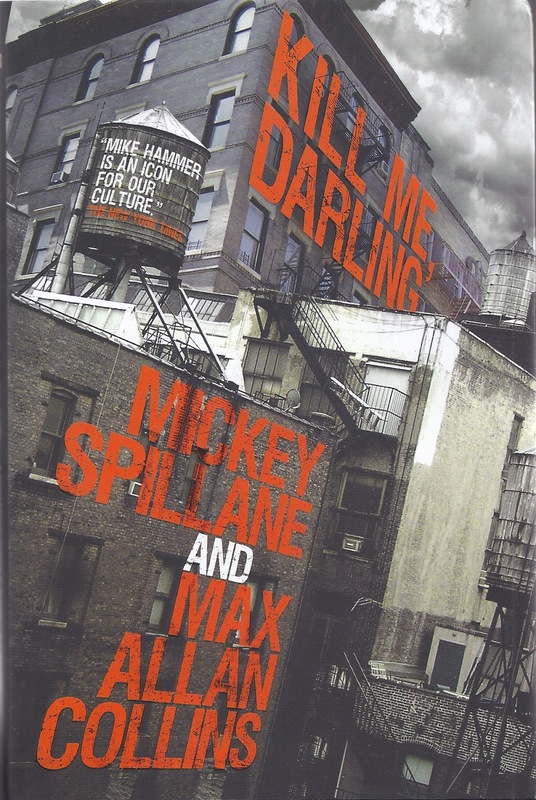 As most mystery enthusiasts are already well aware, for the past few years Mickey Spillane’s pal and protégé, writer Max Allan Collins, has done a wonderful job of completing those unfinished Mike Hammer books Spillane had left behind from bits and pieces found in the late writer’s files. In his introduction to this particular novel, Collins reiterates that mission and goes on to explain how he, his wife Barbara, and Spillane’s widow, Jane, conducted an exhaustive search which led to discovery of as yet more Hammer material. From these lost treasures, Collins plans to fashion three additional Mike Hammer novels, “Kill Me, Darling,” being the first. And what a way to start! It’s the 1950s and private eye, Mike Hammer, is sinking in an alcoholic stupor. All because the one and only true life of his life, Velda, has left him. Without a single word or hint of her intentions, she simply leaves a short note and vanishes. Confused, bitter and decidedly angry, Hammer takes to the bottle to drown the pain of loss. Then he learns that his one time mentor, Wade Manley, a veteran police officer, was gunned down in a seedy part of town and the papers are calling it a random shooting. But even in a drunken haze, Hammer can’t buy the scenario. Manley was an experienced cop who never let his guard down, especially to any nervous street punk. He suspects there’s a whole lot more to the shooting. His suspicions are quickly solidified by his friend, Detective Pat Chambers, who also has some information on Velda’s whereabouts. Chambers has learned through police grapevine that the beautiful brunette is in Miami and supposedly involved with an up-and-coming mobster named Nolly Quinn. Quinn has the reputation of being a ladies’ man with a sadistic streak. Several of his past paramours have disappeared without a trace. Chambers also suggest a connection between Manley’s death and Velda’s abrupt change of scenery. Velda had once worked for the seasoned copper as part of his vice squad and there’s a chance Manley may have recruited her to go to Miami and infiltrate the deadly Romeo’s organization. Word on the street is Quinn wants to bring in drugs through Cuba and setting up a base of operation in Magic City is the logical step in that progression. Without any further ado, Hammer packs up his meager belongings, jumps in his car and heads south. Once in Miami, he sets about finding both Velda and her new beau but as always happens with Hammer, violence and death have accompanied on his trip. The welcome mat is bloody from day one and unless Hammer can sober up fast, his vacation in the sun may be a permanent one. Spillane & Collins’ Mike Hammer stories are as fast paced as a hot Tommy Gun spitting lead and they never miss their target; that of thrills, suspense and mystery. They’ve been imitated time and time again, but nothing ever comes close. The Hammer novels are classics and “Kill Me, Darling,” proves to be no exception. One of the things that we’ve always loved about good mystery writers is there ability to convey the settings in which their stories are set. Robert Parker was extremely deft at this with his Boston based Spencer novels. Now we have a new writer, inspired by the old classic pulp crime thrillers, who is taking us down those same familiar Bean Town Streets. Jenna Coyne is a recent college graduate doing her best to get by while having to put up with an amorous, married boss, who won’t leave her alone. When she finally has no recourse but to verbally rebuff his uncouth advances, she worries about being fired. Or how much should she fight to keep was is really an awful job? Then, upon returning to her quaint, comfortable apartment, she is attacked by two black drug dealers who have mistaken her for the girlfriend of their white pusher who lives across the hall. Apparently Kyle, the opportunistic pusher, owes them a great deal of money and they plan on getting it by threatening his girlfriend. Lucky for Jenna she has a bat-wielding Hispanic friend named Edna who lives nearby with her daughter, Marta; Jenna’s former college roommate. Edna soundly whacks the two hoodlums and chases them off. In the aftermath, Jenna confronts both Kyle and later his actual girlfriend, Vicky Robinson. Jenna is none too happy with having been accosted for someone else. Still she believes there is more to mix-up than Kyle is letting on and she befriends the mixed-up, drug-addicted Vicky. As this relationship takes hold, Vicky confides in her that Kyle worked for her father, an abusive loser who makes a living reposing cars. Eventually the two girls stumble upon a stash of hidden cash worth forty thousand dollars and from that point onwards things turn very, very ugly. Ricci’s storytelling style is crisp and flawless. Most of his principle characters in this book are female and he writes them extremely well. They are fun, intelligent and above all believable. Whereas Jenna’s tenacity and ultimate courage rises logically to the surface as the book speeds to a brutal finale that is nothing less than savage. 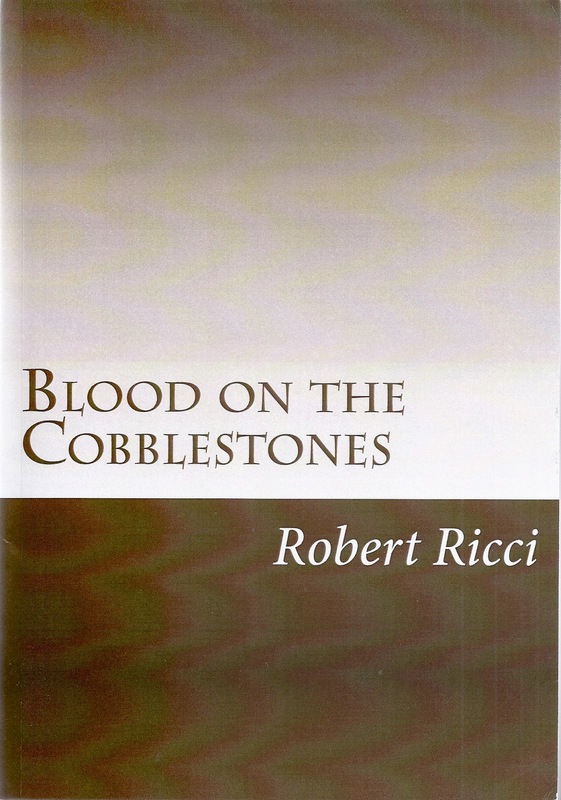 We believe “Blood On The Cobblestones,” is Robert Ricci’s first book and such is one hell of an impressive debut. We can’t wait to see what he offers up next. George Mann is quickly becoming one of our favorite writers. In fact, we actually nominated one of his two Ghost novels for the Pulp Factory Awards a few years ago. He’s a bonafide writer of steampunk whereas we were unfamiliar with this other series of which “The Execustioner’s Heart” is the fourth entry. Let me add, after reading it, we’ve every intention of finding those previous three books. It is obvious the saga of Sir Maurice Newbury and his associate, Miss Veronica Hobbes, is an on-going narrative but Mann is skilled enough to give his readers the pertinent facts from those earlier adventures to both understand and enjoy this volume on its own merits. Like all good steampunk, Sir Newbury and Miss Hobbes live in a world that has both science and active magic. In fact Newbury’s profession is that of a supernatural investigator. It is with this expertise that he assist Scotland Yard and the British Secret Service. Both value his assistance. In this tale, a skilled assassin believed to be immortal has begun killing the Queen’s agents and then she cuts out their hearts as trophies. When the Prince of Wales comes to Newbury seeking his help, he confides in the detective that he believes his mother, the Queen Mother, maybe suffering from senility and thus endangering the empire she rules. There are rumors of foreign agents in London plotting to steal a new heat powered weapon developed by the British Military. As Newbury and Hobbes work to unravel the mystery with their friend, Sir Charles Bainbrdige, Chief Inspector of Scotland Yard, the primary question remains; do the murders have any connection with the spies or are they the result of an entirely new threat from another quarter? Mann’s writing is flawless and he pulls his readers in with a very fine prose that is a joy to read. His characters are likeable and his villains as unique and captivating. In fact, the Executioner of the title is one of the most original, and deadly, personages we’ve ever encountered in fiction. She is a lethal lovely no reader will soon forget. 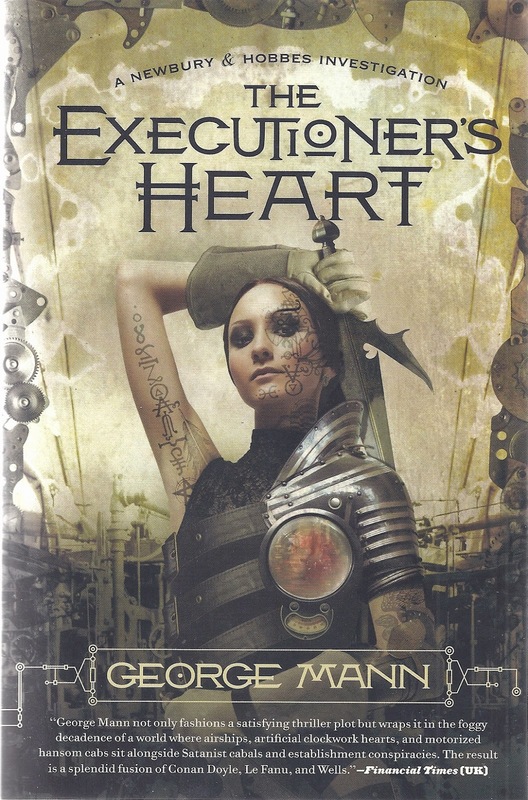 “The Executioner’s Heart” is a terrific, fast paced thriller steampunk fans are sure to applaud. We are only too happy to join in that rousing cheer. When’s the last time you were able to buy a terrific comic book hardback for $20? You’re probably scratching your head right now and coming up with squat. That’s because it’s been that long a time since a superb, quality comic package like this was made available at such a great price. Okay, enough of the sales pitch and no, we don’t work for Dark Horse. Steve Bryant’s Athena Voltaire is a gorgeous female version of Indiana Jones. And that’s really all you need to know about the character to jump right into her adventures; all of which read like they could easily have been adapted as Republic Studio cliff-hanger serials starring Linda Stirling. And now that we’ve said that, I think Stirling would have made a great cinematic Athena. Athena’s father was a famous stage magician, she grew up traveling the world with her parents, became a stunt pilot and eventually began her own flying services. It is the 1930s and the Nazis are popping up all over the globe looking for arcane artifacts their Fuehrer can use to rule the world. In the five colorful graphic adventures collected between these covers, Ms Voltaire travels from Tibet to Mexico and lots of other exotic locales to thwart these agents of the Third Reich from allying themselves with all kinds of demons and monsters. Trust us, her adventures are always fast paced, thrilling and action packed. 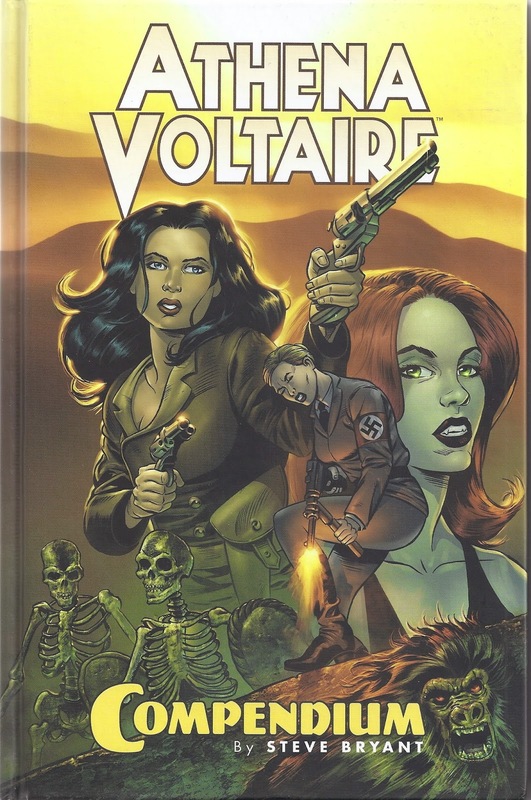 In this era of the New Pulp Movement, Athena Voltaire shines as one of the finest pulp heroes ever created. If you truly love pulp, you owe it to yourself to pick up this book. Then once you’ve have, buckle up for adventure. With Athena Voltaire it never stops!